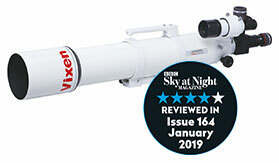 At only 625mm in length the SD81 is the smallest and most portable in Vixen’s new SD range. Perfect for observation and imaging on the move. The SD lens in the SD103S gives excellent optical performance in a short optical tube for easy handling. The largest aperture model of the SD series yet still compact at 940mm long and weighing under 5kg making it suitable for portable observation set-ups. Shown with eyepieces sold separately. The 60mm visual back on the ED range can accept either an optional extension tube or diagonal to accommodate 50.8mm (2”) eyepieces.